(April 2, 2014- Boston, MA): Democratic Candidate for Lt. Governor Mike Lake was officially endorsed by State Senator Sonia Chang-Díaz of the 2nd Suffolk District. Chang-Díaz cited Lake’s record of accomplishment in both these areas as President of Leading Cities—an international organization that focuses on exchanging solutions to municipal challenges and creating jobs through business development—and during his time at the United Way. She also praised Lake’s strong commitment to progressive values over the decade that she has known him. Chang-Díaz—the first Latina elected to the Massachusetts Senate—first met Lake in 2003 and the two stood with fellow Massachusetts leaders in the 2004 fight for marriage equality. Democratic Candidate for Lt. Governor Mike Lake was officially endorsed by Brockton City Councilor Jass Stewart this week. 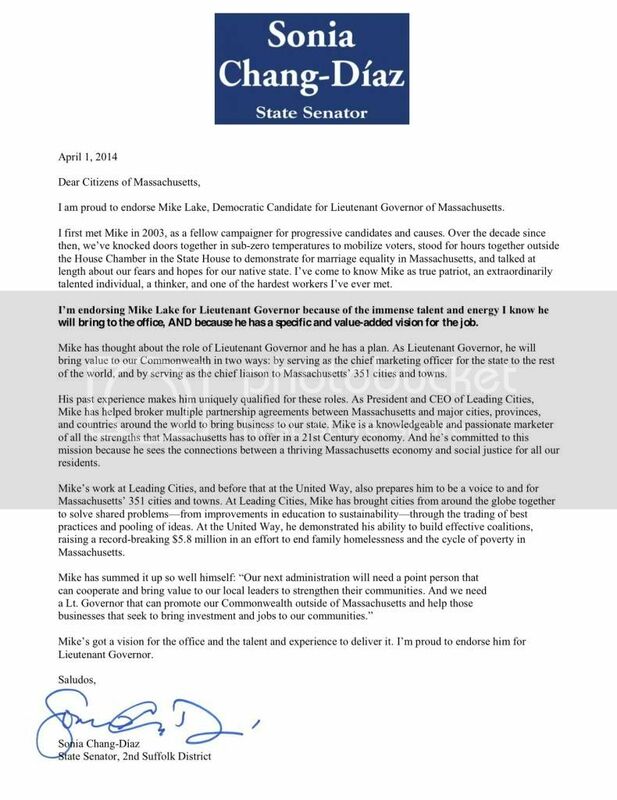 In his endorsement, Councilor Stewart cited Lake’s work to bring jobs to Massachusetts and his ability to develop relationships with city leaders.